This study contributes to building FTA capacities for systemic and structural transformations. Increasing scientific and societal concerns have been raised about the adequacy of current measures of economic performance, in particular that of GDP. Current de-growth discussion summarises the implications. We do not propose a concrete vision but emphasise the need to make it a topic of futures discussions in EU development strategy. An empirical Finnish case study attests to the vital need to revise the current statistical evaluations of European welfare and economic growth processes. The Commission on the Measurement of Economic Performance and Social Progress have been discussing new social welfare evaluation tools. European societies have been locked into socio-economic thought dominated by progressive growth economics. The hegemony of this kind of one-sided thinking has made imaginative thinking outside the box almost impossible. The de-growth topic has become a major international subject of debate, not just within the counter-globalisation movement but throughout the world. The big question is: What are the implications of ‘de-growth’ for the European Union and its policies? Do we need new sustainable macroeconomic policies that go beyond the Lisbon and Europe 2020 strategy? In traditional mainstream economic policy, GDP (gross domestic product) and GDP per capita are often used as measures of national welfare. Although not originally designed for this task, they have become normative benchmarks of economic and social performance (Easterlein 1974). We have to acknowledge that relying on GDP can lead policymakers to draw wrong policy conclusions in the EU and in the EU member countries. For some time now, economists have been proposing a ‘threshold hypothesis’, the notion being that when macroeconomic systems expand beyond a certain size, the additional cost of economic growth exceeds the flow of additional welfare benefits (Daly & Cobb 1989). In order to support their findings, economists and scientists have developed a number of indexes to measure and compare the benefits and costs of growth (e.g., the index of sustainable economic welfare, ISEW and the genuine progress indicator GPI, etc.). In virtually every instance where an index of this type has been calculated for a particular country, the movement of the index appears to underline the validity of the threshold hypothesis. Philip Lawn (2003) has noted that by adopting a more inclusive concept of income and capital, these alternative new indexes are theoretically sound but require the continuous development of more robust valuation methods to be broadly accepted. A set of indicators is more appropriate for expert use, yet hard to communicate to the public and even more difficult to interpret because different indicators usually provide confusing signals. A single index is a highly valuable instrument in political debates and setting targets as well as in communicating such targets to the public. Nonetheless, the European Union’s macroeconomic planning and strategic decision-making requires active development of new relevant sustainability planning and evaluation tools and indexes. We cannot rely on just one index, GDP, in our welfare policy analyses. If the European Union wants to evaluate long-term sustainability of its macroeconomic development, new kinds of statistical analyses are needed. Our study is based on long-term statistics (years 1960-2009) for three key social welfare indicators; statistical analyses have been conducted for the same period for other variables (GS, HDI, and population) as well (Hoffrén 2001, Kekkonen 2010 and Lemmetyinen 2011). The long-term trends of key indicators have been analysed and a statistical correlation analysis between them has been carried out. Our results support the validity of the threshold hypothesis, especially for the years following the oil crisis. Figure 1 demonstrates this in the case of Finland. The idea of the article is to propose a novel sustainability evaluation methodology for the European Commission and EU member countries. This statistical approach is evidence-based and gives new evaluation and planning information about critical sustainability trends in European Union. In our case study, the focus is on Finland and its sustainability trends. A similar kind of indicator-based sustainability evaluation should be done for all EU27 countries to improve the quality of European Union’s long-term sustainability policy and especially its social welfare policy. For some authors, the very idea of sustainable development seems to be a contradiction in terms. It is not a big surprise that practice has shown unequivocally that it is not possible to reconcile economic growth with environmental sustainability. Some parts of the global scientific community, for instance those participating in the UNEP (see IPSRM-UNEP 2010), think that the Western lifestyle is damaging not only its own environment but also that of the poorer countries and the planet as a whole. In this context, the proposal of ‘sustainable de-growth’ has emerged as a strategy that aims to generate new social values and new policies capable of satisfying human requirements whilst reducing the consumption of resources. De-growth is a political, economic, and social movement based on environmentalist, anti-consumerist and anti-capitalist ideas. ‘Sustainable de-growth’ or ‘de-growth’ is not yet a formalised theory but rather a focal point for social movements, academia or politics to rally around (Latouche 2006). De-growth supporters have advocated the downscaling of production and consumption – the contraction of economies – as overconsumption lies at the root of long-term environmental issues and social inequalities. Key to the concept of de-growth is that reducing consumption does not require individual martyring and a decrease in well-being. Rather, ‘de-growthists’ aim to maximise happiness and well-being through non-consumptive means: sharing work, consuming less while devoting more time to art, music, family, culture and community. De-growth – in contrast to the idea of dematerialisation, which aims at a reduction of resource use while the economy continues to grow – goes further and means that significant reductions of resource use require fundamental changes in the production and consumption system. The de-growth movement opposes economic growth, which has created many more poor people and has inevitably led to environmental degradation. From this perspective, the de-growth strategy opposes the Europe 2020 policy. In any case, the de-growth movement’s future success will depend on its capacity to generate coherent political responses and empirical results to shore up its proposals. This study contributes to tackling this challenge facing the de-growth movement. In the case of Finland, we observe a negative correlation between GDP and GPI after the oil crisis years. Growth of GDP appears not to be connected with improved GPI development. GDP still correlates positively with GS and HDI. However, the correlation rates are much lower now than before the oil crisis. When we discuss de-growth policy and its potential content, we must bear in mind that there are various aspects of welfare beyond economic growth alone. In the Finnish case, we can note that the linkage between GDP growth and welfare indicators is not as strong as it was before the oil-crisis period. Yet, we must also remember that the GDP indicator too includes immaterial and qualitative aspects of welfare. If we think of de-growth from this perspective, it is not a rational aim to radically minimise GDP growth. Probably we should try to find a “golden middle of the road solution”, which is a rather unadventurous or inoffensive path that does not go only one way or the other (neither de-growth nor growth mania). Another policy conclusion from our empirical analysis is that GPI is a critical indicator for the de-growth movement because the GPI indicator provides empirical foundations for the anti-growth movement and its form of welfare thinking. 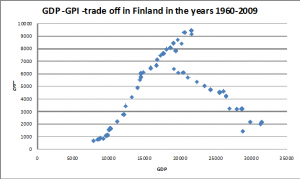 In Figure 1, the trade-off curve of GDP and GPI is plotted for Finland for the years 1960-2009. The turning point of GDP and GNI (Gross National Income) trends was in 1988. This year can be seen as a benchmark year because in 1988 Finland reached the peak level of welfare as measured by the GPI. Although GDP has grown in Finland, GPI has not increased since. Socially and politically the situation is most problematic. In the study, a long time series (years 1960-2009) was initially analysed by Pearson correlation analysis. Subsequently, the time periods before the oil crisis (years 1960-1972) and the time period after the oil crisis (1973-2009) were analysed in the same way. Six welfare indicators were correlated. In the long run, the GDP correlates positively with five other indexes of the Finnish case study. Before the oil crisis, positive correlations were strong between the GDP index and the other indices analysed. After the oil crisis, however, our statistical analysis clearly supports the threshold hypothesis in the Finnish case. Especially the correlation between GDP and GPI has shifted dramatically in Finland after the peak year 1988. A single aggregate index, such as GDP, is certainly a valuable means of communication for policy purposes. At the expert level, however, a set of indicators is a more appropriate toolbox, even though it may be harder to communicate and more difficult to interpret because of different and sometimes opposing signals. As this case study shows, a single aggregate index can lead to very problematic policy choices in the EU member countries. There is a need to develop a sustainable de-growth strategy that goes beyond the Lisbon and Europe 2020 strategies. Many European governments may face a new situation where welfare indicators are developing in an undesirable direction although the GDP indicator shows economic growth and successful economic performance. This phenomenon was also observed in the Finnish case study. Despite all theoretically and empirically motivated criticism of GDP as a social welfare and progress indicator, the GDP’s role in economics, public policy, politics and society seems to remain influential also in the future. The European Union’s macroeconomic planning and strategic decision-making urgently calls for new sustainability planning and evaluation tools and indexes. We cannot rely on just one old and much criticised GDP index in our European welfare policy analyses. Relying on inadequate signals in coordinating common EU policies may very well lead member countries to make wrong policy decisions. We now need new macro-aggregates, such as ISEW and GPI, to foster our socio-economic performance and competitiveness. In evidence-based policy making, the European Union should pay more attention to the underlying motivation of growth policy because what we understand as economic growth today does not necessarily contribute to welfare in any linear fashion. Our study is important because it shows that, if we evaluate welfare by the GPI index, this is precisely what has been happening in Finland: there is no longer any immediate link between economic growth and general social welfare. Especially under the Europe 2020 strategy process we need broader evidence that the political decisions taken are actually leading Europe toward improved welfare. The possibility that the threshold hypothesis adequately describes the reality in the European Union countries should be taken more seriously in various policy fields. In a recent study, the Nobel prize-winning economists and professors Joseph E. Stiglitz, Amartya Sen and Jean-Paul Fitoussi (2009) (SSF report) urge the adoption of new assessment tools that incorporate a broader concern for human welfare than just economic growth. By their reckoning and insights, much of the contemporary economic disaster owes to the misbegotten assumption that policy makers simply had to focus on nurturing economic growth, trusting that this would maximise prosperity for all. The case study of Finland shows that this taken-for-granted assumption is too simplistic. In this light, the policy recommendations of SSF Report are highly policy relevant for the European Commission and EU member countries to achieve greater social welfare to actually improve the lives of their citizens. Aldrich, J. (1995): Correlations genuine and spurious in Pearson and Yule. Statistical Science 10 (4), pp. 364–376. Daly, H. & Cobb, J. (1989): For the Common Good. Beacon Press, Boston. Easterlin, R. (1974): Does economic growth improve the human lot? In: David, P., Weber, R. (Eds. ), Nations and Households in Economic Growth. Academic Press, New York. Hoffrén, J. (2001): Measuring the Eco-efficiency of Welfare Generation in a National Economy. The Case of Finland. Statistics Finland Research Reports 233. Helsinki. And update by Hoffrén (2011). Kekkonen, E. (2010): Hyvinvoinnin ja edistymisen kuvaaminen yhdistelmäindikaattorilla: Suomen kestävän yhteiskunnan indeksin laskenta. Master’s Thesis. University of Helsinki. Department of Economics. Helsinki. Latouche, S. (2006): Le Pari de la Décroissance. Fayard. Paris. Lawn, P.A. (2003): A theoretical foundation to support the Index of Sustainable Economic Welfare (ISEW), Genuine Progress Indicator (GPI), and other related indexes. Ecological Economics 44 (2003), pp. 105-118. Lemmetyinen, I (2011): Genuine Savings – indikaattori Suomelle. Master Thesis. Aalto University. Helsinki School of Economics. Helsinki. Rättö, H. (2008): Hyvinvointi ja hyvinvoinnin mittaamisen kehittäminen. Statistics Finland. Research Reports 250. And update version by Hoffrén (2011). Helsinki. Stiglitz, J.E., Sen, A. & Fitoussi, J.-P. (2009): Report by the Commission on the Measurement of Economic Performance and Social Progress. Commission on the Measurement of Economic Performance and Social Progress. France.